The historical ,widespread use of coolants as MWF’s has overshadowed MQL and kept it as a marginal technology. Sadly, not many machinists know or truly understand the concepts behind MQL and therefore never get to enjoy its many benefits. In an industry where production efficiency is crucial, the unknowns of a ‘new’ technology pose the potential threat of complications and downtime. The fear of the unknown may be the greatest challenge to MQL, and the fact that a large percentage of metalworking equipment comes already equipped with flood coolant systems is surely no help either. The concept of MQL is fundamentally different than that of flood coolant and this can be a large stumbling block to machinists who are new to MQL. The use of flood coolant is incredibly basic. As long as relatively clean coolant ‘floods’ the interface of the cutting tool and workpiece, the heat generated by machining operations is kept at bay. This process works (another reason it is widely accepted! ), but has some significant consequences. One of the main downsides to the use of coolant, is that it adds extra equipment into the equation. Equipment to recirculate, filter, test, and treat coolant to keep it viable is required. Contamination from bacteria, tramp oil, and swarf are major concerns as the disposal of spent coolant. Spent coolant is typically classified as toxic waste and its disposal is regulated. Users of flood coolant must factor the cost of its disposal into their machining costs. Another consequence of coolant is that it’s messy. Despite containment methods, coolant invariably winds up covering more than just the cutting tool and work. Machines, floors, and finished parts are often left wet from coolant, causing potential slip hazards and often requiring part cleaning before secondary operations can take place. Repeated exposure to many coolants can have real consequences for the humans involved as well. Some coolants have been shown to cause dermatitis and to be carcinogenic with long-term exposure to coolant vapor. Studies have shown that the cumulative cost of coolants/MWFs can equal as high as 15% of the total cost to produce a part. The cost and negative effects of flood coolant set the stage beautifully for MQL. 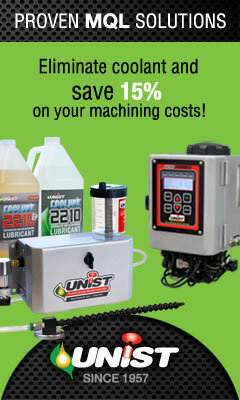 When presented with an alternative which saves money, eliminates the mess, disposal, and negative aspects of coolant, you’d think that machinists everywhere would be scrambling to implement this new technology wouldn’t you? In fact, MQL technology has gained much wider acceptance in European machining due to stricter environmental regulation. In the U.S., MQL still faces an uphill battle to win the ‘hearts and minds’ of machinists. This website attempts to promote MQL knowledge and awareness in the industry and will hopefully become a forum for the discussion of this emergent technology. In a nutshell, MQL makes us of a lubricant, not a coolant, and does so in ‘minimum quantities’ (like its name!). Where coolants flood the interface in an attempt to cool things down, MQL coats the interface with a thin film of lubricant and prevents heat build up through friction reduction. The excellent lubricity of a good MQL lubricant means that the majority of the heat from friction is transmitted to the chip and exits the interface as chips are expelled. This lubrication and transfer of heat keeps the cutting tool much cooler and reduces tool wear. It is not uncommon for machinists to experience twice the tool life after adopting MQL. MQL lubricants are mostly consumed in the cutting process. The friction and heat in the interface vaporizes the small amount of lubricant and leaves cutting tools, parts, equipment, and floors dry and clean. The swarf or chips from cutting with MQL are virtually dry and can be recycled without cleaning and for greater profit. With MQL, parts oftentimes do not require any cleaning before secondary operations take place. Because the lubricant is consumed, there is no disposal required and no extra equipment is necessary for fluid reclamation. Many MQL lubricants are essentially highly refined bio-based (plant) oils and are completely safe for skin contact as well as having the extra benefit of coming from renewable, environmentally-friendly material. One important distinction to make when considering MQL, is that the “minimum” in “Minimum Quantity Lubrication” should not be overlooked. In a typical metal cutting application, an MQL applicator will dispense only ounces in an 8 hour shift. This reflects the potential cost savings in using such small amounts of product, but also highlights the balance in fluid delivery that must be achieved with MQL. For MQL to be successful, the methods and mindset of flood coolant must be forgotten. With MQL, more fluid is not necessarily beneficial. In fact, too much fluid can cause tool life to suffer just as much as too little. Where flood coolant covers a multitude of machining parameters with a one-size-fits-all ‘flood’ of product, MQL attempts to dial in the precise amount of fluid required for a specific operation. Understanding the nuances of MQL and how to ‘dial in’ this ideal amount of lubricant is key if an MQL solution is to be successful. This precise nature of MQL and achieving the correct amount of lubricant presents an intellectual challenge. Pouring on copious amounts of a costly and potentially hazardous product while easy, may be eating into profit from machining operations. Armed with a basic knowledge of MQL fundamentals, there should be nothing preventing the average machinist from taking advantage of Minimum Quantity Lubrication’s many benefits. We hope you will check back with us often for more information on MQL including articles from different sources, case studies, testimonials, videos, etc. If you are a machinist who has had success (or even failures) with MQL, we would love to hear from you! Contact us to share your story!